Here's one of the best I've ever gotten re "The Best Seat In The House." I just received circuitously via my agent in New York because my email service on this site messed up again. In any case, this note goes on top of a big stack. I will now shamelessly reproduce it as a way to thank the very thoughtful Judy Finelli. "Mr Rucker, you wrote one hell of a book. I loved it! I am a 61 year old quad and you had me in tears, laughing and crying in recognition. As far as I am concerned, you did the impossible -- you found the humor in the horror. Not only did you tell your own story, your own personal truth, but you told all of our stories. That's the neatest trick of all. Gratefully, Judy Finelli, San Francisco Clown Conservatory"
Thank you, thank you, Ms. Finelli. I say, if you want to be a clown, go see Judy. If you didn't catch Tuesday's New York Time Health section, you probably missed this astounding story. I'll just give you my own headline. THERE ARE A HELL OF A LOT MORE PARALYZED PEOPLE IN AMERICA THAN EVER IMAGINE! * There are 5.6 MILLION people in the US paralyzed by a central nervous system disorder. That's almost 2% of the population. * There are probably FIVE TIMES as many SCI paralytics out there as previously thought. The old number, seemingly writ in stone, was 250,000. The new number: 1.275 MILLION. Big dif. * The number of people with paralysis due to MS -- where I more or less fit -- was estimated to be 939,000, which is TWICE the previous estimate of all people with the disease, period. All of this leads me back to a question I have had since the day I became paralyzed. With all those paralyzed people, a majority of them in wheelchairs, I'd guess, how come I rarely see any of them in public? You go to IKEA on a Saturday, the place is filled because they're having a sale on cooking pots or something, and you'll see one or two wheelchair users, tops, and one of them is simply overweight. Strange. 2% of the population and it's virtually invisible. 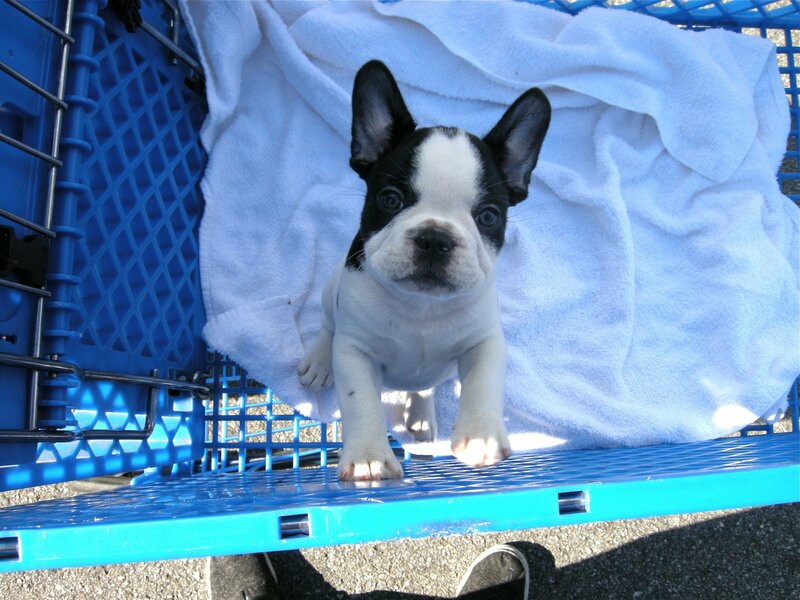 A recent addition to our extended family. 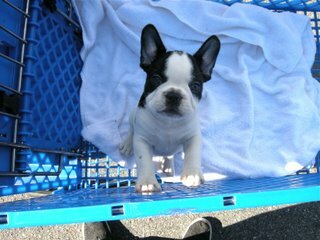 This is Buster, a French bulldog or "Frenchie," as a pup. A few months later, he now weighs in at 25 beefy lbs. It's hard to be depressed when you're around Buster. Please check out -- if you are so inclined -- the April 09 issue of NEW MOBILITY MAGAZINE, either hard copy or on line. I wrote the cover story about Hollywood and the disabled, called THE NEW GIMP MEDIA REVOLUTION. Also, I'm proud to say that I am now a Contributing Editor to NEW MOBILITY, a fine mag which has just been nominated for 2009 UTNE READER INDEPENDENT PRESS AWARD in the category of Health/Wellness Coverage. Congratulations, Editor Tim Gilmer, Publisher Jeff Leonard, Editorial Director Jean Dobbs, Managing Editor Josie Byzek, and all other staff and writers. NM celebrates its 20th anniversary this year and deserves your support.